The school summer holidays. Sometimes we dread them arriving. How will we keep our children occupied, find time to work and have a rest ourselves? But the six-week holidays are no sooner here, and we really start to enjoy them and then are gone. Then we start to panic about how we are going to get everything ready for when our kids return back to school. Starting primary school is a big milestone and huge step in the life of a child and their parents. 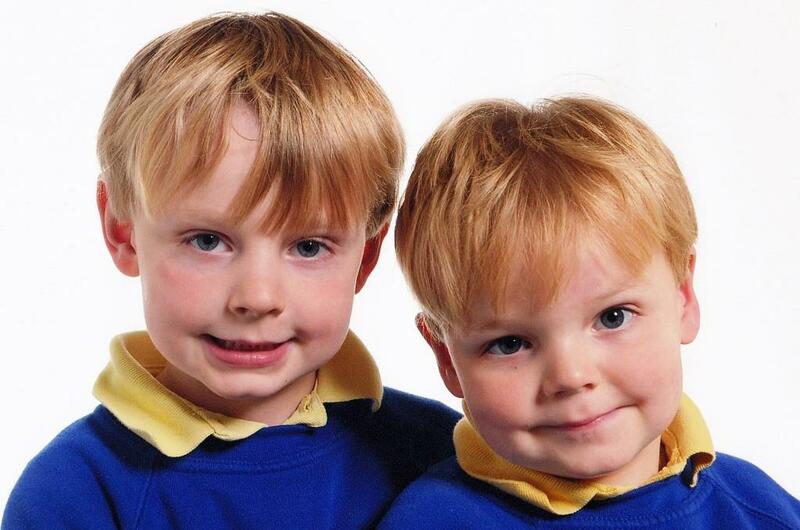 My children are about to go into Years 4 and 6 in Primary School. There are many things I did when they started that I have since learned just aren't necessary. A bit like when you have a second child you realise what you actually need rather than what someone is trying to sell you. 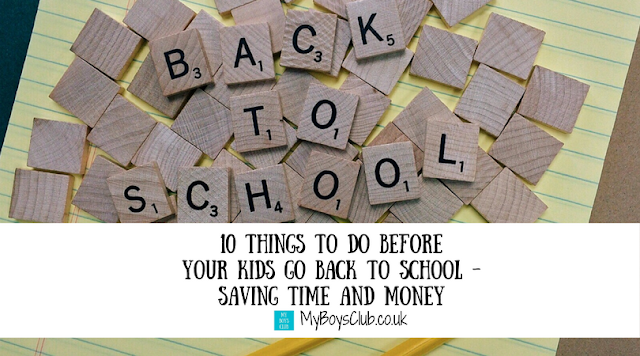 So now that we have over six years experience of preparing for the new school academic year, I thought I'd share some of my top tips for starting school with you, that will not only hopefully save you money but also some precious time too! 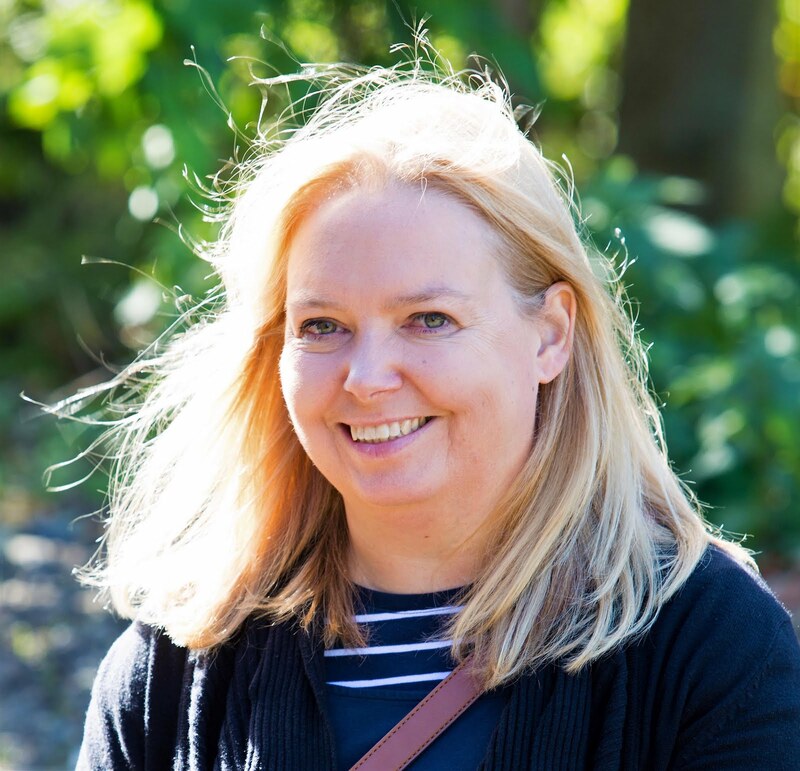 My top tip for buying school uniform is to see how close to the school official one is the stock that your local supermarkets have or see what is available online. Supermarket boys trousers are such good value - each pair we've bought from Asda or Sainsbury has done two kids - and ones that love to play football and roll around in mud I may add. Jumpers from supermarkets are actually better in my opinion - go over heads easier, keep their shape and softness and wash lovely too. Polo-shirts are available in many colours, they may not have the school badge, but if under a jumper that is hardly seen anyway and you'll find many children have plain polo-shirts. Plain blue shorts and a white t-shirt are all out kids need. But in the first years (basically until every child in class can dress themselves) PE was just done in uniform. Check if your kids need plimsolls before you buy them, as at our school all indoor activity is done barefoot. If they do need a kit a simple bag to keep it in is fine - just remember to write their name on it. The other question is how many items pieces of uniform to buy. We have four pairs of trousers for each child, a polo-shirt for each day - especially when they are little and a couple of jumpers or fleeces. Yes, you can wash them every night and I started out buying less, but over time have decided that having enough uniform to last a week is so much less stressful for the parent. Also, check out local school uniform collections either via your school or nearby community centres where people take uniform that now too small for their children to swap. Or do this informally with other parents. This always a tricky one. Do you go to the shops and get the boys' feet measured early in the holidays before it gets too busy and risk their feet growing too much? Or wait until the last minute and queue with lots of other stressed parents? And also don't just buy new shoes for the sake of it. If lasts years still fit just keep on wearing them. You'll be needing to buy new ones soon enough when their feet grow. Once you've decided when the next question is where. Shoes aren't cheap. Supermarkets sell some nice ones but they don't tend to last. You can also buy online if you know your correct size. However, rather than the expensive high street stores we head to the retail parks and check out the offers in the outlet stores. When my boys started school I bought iron on labels - really good value at £5 from M&S and they let me have two names in one allocation. However, it wasn't many years into school life when I decided a permanent marker such as a sharpie pen was the best option. Don't just write on the labels they can be cut out - I write on the inside hem. Don't forget coats too. And really importantly write your child's name how they know it. E.g. When they are really little use small case letters, use the shortened named if that the name they use. This is something I learnt when mine were little, write their names in capitals as it was easier for me but they didn't recognise the letters. Especially if it's a new school why not actually walk with your child to school to see how long it takes. If you plan to take the bus check times, routes, fares and bus stops, even just to see they have not changed over summer. If you drive to school ensure sure you know where you can park safely outside of your school. Are you doing school dinners or packed lunches? Last year we swapped to packed lunches I bought these great lunch boxes from Amazon and I make lunches every morning before going to school. I plan the whole week on a Sunday - shop for supplies - wraps, fruit, sandwich fillers then I make enough dates bars and pizza wheels to will last the whole week. School dinners are even easier just make sure you know how much is payable and by when and check out if you are eligible for free meals too. All KS1 pupils are entitled to a free school lunch. KS2 is dependent on individual circumstances. This can save so much money as well as providing your child with a hot dinner every lunchtime. Keeping hydrated has so many benefits not just for adults, but for our children too. Our school like many others doesn't have expensive water coolers instead each child has their own water bottle to drink from during the day. 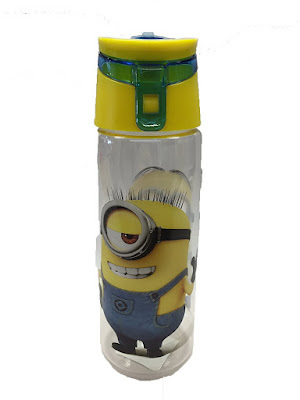 Again write names on them - it may be a distinctive Minions bottle that your child has chosen but there could be 30 Minions bottles in one class. If your child is having a packed lunch don't forget an extra bottle for lunchtimes too. Working from home we are pretty lucky not to need to pay for before and after school child care. On the odd occasion, we have our school has an after school club attached that we've been able to use. Also, check out any after-school clubs that your school provides either free or for very little charge. Sports clubs, cookery clubs and dance after school can be a very effective and inexpensive means of childcare, as well as providing great experiences for your kids. It's summer now, not that that has stopped the rain. 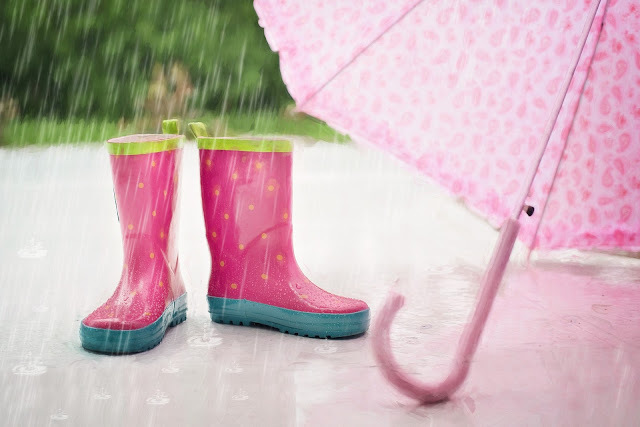 But don't get caught out by heavy downpours during term time. Have you got wellies, raincoats and umbrellas to hand and in the right size? Starting school or returning to school is a very important part of their development and life. Be happy for them. Don't cry at the school gates - your fears and sadness could transfer to them. Crying can be contagious or you may make them think they should be upset because you are, when they are not, making them even more confused. Say you'll miss them but talk about the great things you'll do together after school and about how you can't wait to hear what they've been up to. I love hearing and seeing what the boys have been up to at school and watching them become that little bit more independent every day. Yes, return to school might be coming up and we are all busy preparing but make sure you make the most of the summer holidays too. We have lots of suggestions on the blog. When they have started school make sure you get the mobile phone numbers of some parents in your child's class. No, not for meeting up for a coffee - although that sounds good to me - but in case you are ever late for pick up. Knowing there is a parent there, that your child knows, saying don't worry you mum/dad has asked me to stay with you until they arrive, will make your child (and you) feel so much better. Return the favour too! Do you have any more tips to add? I'd love to hear them. 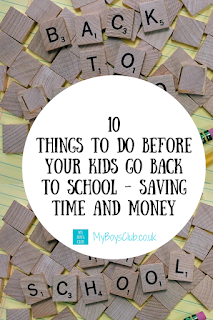 Some great tips here, especially as I am preparing for my baby to go to school. Just don't want it to be here lol! Great tips and anything which has the 2 words "save money" always goes down well with parents. We have a facebook group so that we can check on what is going on (non uniform, inset etc), sooooo helpful! I only have one left at primary school this year, my other is about to embark on her first year of secondary school. She's a pretty nervous type so I'm going to have to be offering lots of reassurance and cuddles. This is such a great list. My little one is still nursery age so still a way to go yet, but the name labels is useful for us even now! This is the perfect list that all parents need to read! Thank you for this post - you have jogged my memory on a couple of things I still need to get! What a great list! I have been trying to get organised but all of a sudden we have just two weeks to go and I have done very little to get ready for school! We have had lots of days out though!